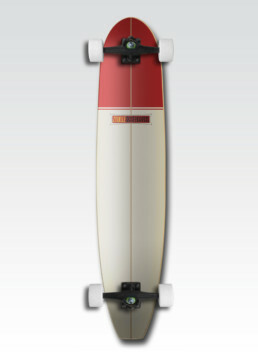 Since the first time I was contacted to design graphics for a skateboard deck I have loved it. Having grown up surfing and skating in Southern California, designing decks is right in line with my interests. These longboard decks are some of my favorites. 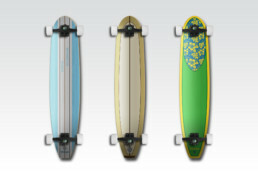 I was asked to create a new custom shape that looked more like a classic longboard surfboard than the usual choices. Lucky for me, I own a couple of vintage boards that I could base my design on. Once the shape was finished, I took the same approach with the design.